There’s no country better than India for travelers seeking a true culinary adventure. It’s the land of spices and delicious flavors, and with different parts of the region offering its own take on the cuisine, there’s definitely something for everyone. While the country is a heaven for spicy food lovers, it’s normal for travelers who cannot take the heat to worry what to eat in India on their visit. The locals love using spices on their food, but it doesn’t mean that the spice-level is off the charts for every dish. The country offers a variety of flavors suitable for everytaste bud. If spicy food is not for you, fret not because you will not go hungry on your visit to India. Here are non-spicy Indian food that are still full of flavors and texture. Samoas are pockets of savory potatoes, chickpeas, and onion. It can either be deep-fried or baked, but it’s always served in a triangular shape. It’s a bit likeempanadas and it can be filled with meat or just vegetables. Samosas are best paired with chutney, a dressing made of fruits, vegetables, and spices. You’ll encounter samosas of varying heat level in South Asia, so make sure to ask for the non-spicy variation or ask your travel buddy to taste test it for you first. Who doesn’t like chicken? India has tons of ways to prepare their chicken, and Chicken Korma is for those who like theirs sweet, nutty and smoky. Cooked in coconut milk, butter, yogurt or cream, cumin and other spices, the chicken meat is braised to a creamy stew. The stew can also serve as a dip for your naan. It can be mildly spicy at times so taking a precaution is still necessary. Similar in appearance to crepes or pancakes, dosa is made with fermented batter, spread thin and cooked until crispy on a skillet. It can be stuffed with a mixture of potatoes and paneer, and best dipped in a variety of chutney. To make the meal even more appetizing, it’s ideally served with sambar, a vegetable stew cooked with a tamarind broth. This is the Indian subcontinent’s take on deep-fried vegetables. Pakora is generally vegan and prepared with potatoes, onions, spinach, cauliflower, and other vegetables. It can also be mixed with chicken, but the vegetable-only variation is more popular. Some pairs pakoras with chutney as well. Pakoras are perfect as appetizers or snacks, but it’s also often served with Masala chai in Indian weddings to welcome guests. Pakora can also be called fakkura, bhajiya, pakoda, pakodi, bhajji or ponako, depending on the region where it’s being served. In North India, you’ll find creamy and crunchy paprichaat being sold in the streets, being one of the most popular streetfood in the region and deservedly so for its sour, tangy, sweet, and sometimes spicy flavor. These savory snacks are made from crispy dough wafers with boiled potatoes, yoghurt, chickpeas, and tamarind chutney. It’s topped with bits of sev, crunchy noodles made from chickpea flour paste. 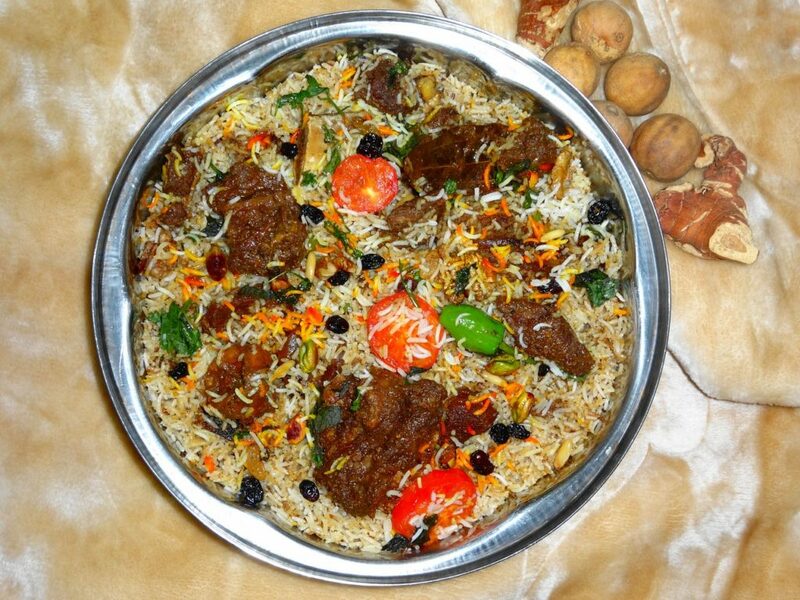 Biryani is arguably one of the most popular dishes in the region, with numerous local varieties originating in North and South India. It’s a mixed rice dish made from rice, vegetables, eggs, a choice of meat, and spices. It can be prepared in a spicy and non-spicy way, depending on the spices used, and the choice of meat includes chicken, beef, goat, fish, or prawn. The vegetables used also vary from region to region, with some opting to include corn, while others also add fruits such as pineapples and apples. For a full meal, try biryani with a curry dish, salad, or korma. For your fix of leafy greens, try saag paneer. Saag is a classic Indian dish often made with mustard leaf, broccoli, collard greens, spinach, basella, and more. Saag paneer goes well with roti or naan, and in other parts of the Indian subcontinent, it can also be eaten with rice. It can also be called saagwala. Paneer, on the other hand, is unaged cheese popular specifically in India. To make Saag Paneer, just throw in the fried paneer cubes in the freshly made saag. Even carnivores will love this vegetarian dish due to its richness in flavor. Made from potatoes (aloo) and cauliflower (gobi), its yellow color is due to the turmeric and other spices used to flavor the dish. This classic Punjabi dish is also best cooked with garlic, ginger, onions, cumin, kalonji, and curry leaves. Another popular Punjabi dish, Chicken Tikka is considered to be the boneless version of chicken tandoori.After being marinated in various spices and yogurt, the small boneless chicken is baked in a brazier using skewers. While being baked, the chicken pieces are repeatedly brushed with clarified butter or ghee. In some versions of this dish, the chicken is not necessarily boneless and grilled using hot coals. Some versions of this dish can be spicy so it’s best to look for one that’s not. 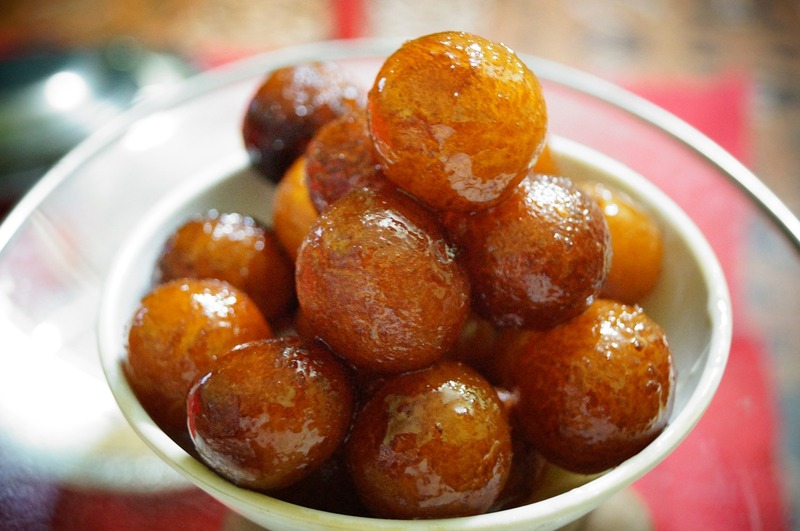 For desserts, try the sweet and sticky Gulab Jamun. It’s made from reduced milk called Khoya, which is prepared by heating milk for a long time to achieve a solid consistency. The milk solids are kneaded and shaped into small balls and deep fried after. To complete the dish, the deep-fried balls are soaked in sugary syrup that comes in different flavors. Its maroon color and shape resemble the tropical fruit jamun, thus the name Gulab Jamun. Idli is India’s take on savory rice cake. Usually served for breakfast, it’s similar to the Chinese bao in texture, but it’s made by soaking uncooked rice and white lentil separately overnight. Fenugreek seeds and other spices are often added during the soaking for additional and more layered flavors. Idli can be served with coconut chutney, onion-based chutney, sambar, or fish curry. Vada is a savory fried snack resembling a doughnut, but it can also be referred to as India’s variation of fritters or dumplings. It can be served as a breakfast food or snack. Made out of potatoes, sago, or legumes such as black gram, chickpea, green gram, or pigeon pea, it’s best served hot for that crunchy texture. Vada can also be used to prepare other dishes such as Vada Pav or Dahi Vada. In the 40s, a restaurant owner in Delhi needed a way to prevent tandoori chicken from going to waste by stewing it in a mild curry sauce and butter. Butter chicken, also known as Makhani, can be spicy at times but variations of it can make the heat level bearable. What makes it different from other curry dishes is the cream and yoghurt used in preparing it. Butter chicken is a good introduction to Indian cuisine for those who have yet to immerse themselves in a true gastronomic experience in India. The country loves its spices and the magical dishes they can make out of it. Indian cuisine is generalized as too spicy, but they also have non-spicy dishes that are just as flavorful. As a general rule, South Indian dishes are spicier than North Indian cuisines, which are mellower in flavor. When ordering at restaurants, try asking the servers which ones the North Indian dishes are. While some dishes may still pack a kick, it’s a lot safer than the typical South Indian spicy dish. And when all else fails, it’s better to ask which dishes on the menu are not spicy at all, or at least ask the restaurant to serve a non-spicy version of the dish. The trick is to ask waiters and locals which dishes they can recommend to someone who do not eat spicy food well. 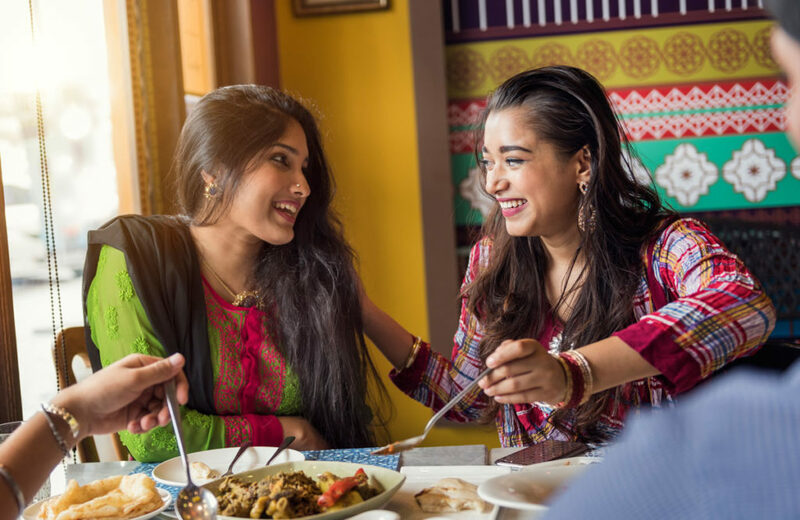 While it’ll be easier to try other cuisines instead of the local dishes, it’ll be a shame to visit India and not have a mouthful of all the flavors the country offers.